The state of Pennsylvania has a long and difficult history with energy projects. They’ve endured disastrous coal mining incidents such as the infamous Knox Mine Disaster in 1959, where the Susquehanna River broke through and inundated a network of mines, killing a dozen workers. The Centralia mine fire that started in 1962 involves 3,700 acres of land, where coal seams up to 300 feet down keep burning. Today, 53 years later that coal is still burning, and could burn for centuries to come. And today fracking operations dot their landscape and poison their wells. Pipelines stretch out in all directions to spread the pain away from the immediate fracking wells to engulf people all over the state. Sometimes when I talk to Pennsylvanians on this subject I get a strong vibe akin to talking to a terminal patient in the hospital, there’s a sense of someone who has fought a series of long hard battles and who knows the end isn’t going to go well. But I see new hope blooming in Pennsylvania, springing up in our midst right alongside the Spring daffodils. In an unprecedented some townships in the state have enacted formal resolutions against the pipeline. The Cooks Creek Watershed Association worked in concert with Concerned Citizens of Durham Townsphip against the Pipeline, Concerned Citizens Against the PennEast Pipeline of Williams Township, and stoppenneast.org to get a billboard against the pipeline installed on route 12. 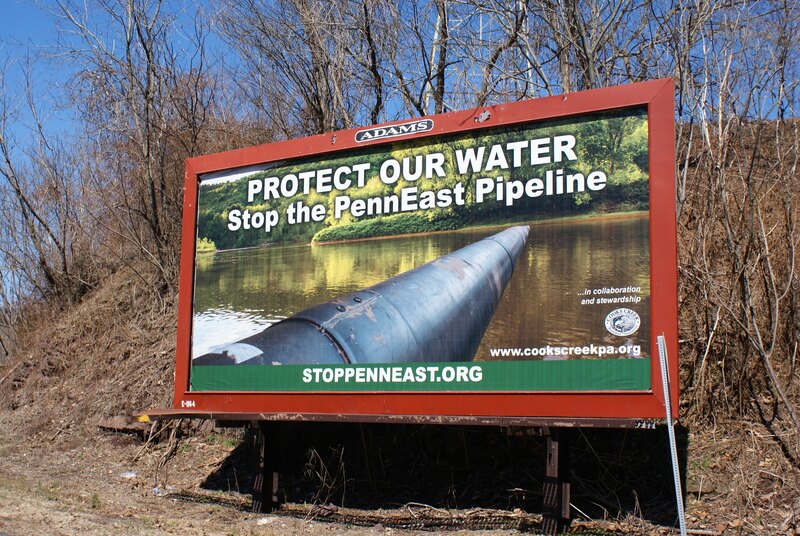 After careful review of information available to date, the Environmental Advisory Council of Easton, Pennsylvania wishes to record our opposition to the proposed PennEast Pipeline. We are concerned that the proposed Environmental Impact Statement (EIS) will be incomplete and not adequately weigh the direct economic benefit of PennEast Pipeline Company LLC to the risks and costs to the communities that will be forced to play its host. Carbon absorption. “What is the total amount of carbon absorption lost due to the cutting of trees in the pipeline’s path? What is the net increase in GHGs attributable to this loss of vegetation?”. Blast zone. “What is the radius of likely property damage and loss of life, should the pipeline explode? This should be based on the total amount of gas under pressure proposed for the pipeline. A map should be prepared indicating what properties adjoining or in proximity to the pipeline will be subject to increased risk of property damage and bodily harm”. Let’s hope that the FERC takes heed of this and similar submissions and forces PennEast to submit detailed studies and analysis of all of these topics. On the issue of economic benefits in particular I would go even further than Mr. Dohe’s request for an audit of PennEast’s Drexel University study. I would demand that an independent study be conducted, paid for by PennEast but selected by a neutral third party, which considers the true economic impact to our communities including all of the negative impacts the construction will entail in our region, including but not limited to loss of business due to construction near businesses, loss of tourism dollars in affected tourist destinations, funds spent by local, county, and state governments to study and respond to PennEast and FERC’s scoping process which could have been spent on more constructive projects, economic impact of traffic issues during construction, and permanent economic losses incurred by properties and landowners along the permanently cleared 50′ right of way.